Does Yellowstone Need to Raise Entrance Fees? Comments Off on Does Yellowstone Need to Raise Entrance Fees? Since 2006 a family’s private passenger car has been able to enter Yellowstone and the Tetons combined for a $25.00 entrance fee. If you return several times in a year, you are better off to buy the $50.00 annual pass for both parks. Seniors (62 and older) are able to purchase a $10.00 pass good for their lifetimes, a bargain for sure, what with the increasing lifespans of today’s seniors. Separate annual passes for each park for $60.00. Eighty percent of the money derived from entrance fees goes to the park where it is collected, while twenty percent goes to the general NPS fund, mostly used for parks where fees are not collected. There is also an annual national park appropriation from Congress, which for many years has been inadequate to cover even routine expenses, such as park personnel salaries, utility bills, and the like. Looking at what the “extra” money from entrance fees goes for in Yellowstone, most of it is desperately needed for maintenance of buildings and roads, now used by over three million visitors each year. More money for Yellowstone can also mean that the park can continue and expand the fight against the lake trout, those huge fish that have been decimating the native cutthroat population so many park animals depend upon. NPS is accepting comments on their website (not by e-mail or fax). You can read the entire fee change document there. Use this link to comment on it. You have through Saturday, December 20th, to comment. Click on Entrance Fee Proposal and then in the Comment Now box. The question of whether or not the grizzly bear should be removed from the Endangered Species List is still being studied. The Interagency Grizzly Bear Study Team will present its report December 11 in Missoula, MT. Grizzlies may not really be at risk, their report says, since the bears do not depend greatly on the now-relatively-scarce whitebark pine nuts for late-season food preparing them for hibernation, as many knowledgeable people have asserted. Instead, they are turning more to meat and foraging at lower elevations than previously. “A 75 percent reduction in whitebark numbers since 2002 isn’t cause for worry,” states the study’s report. But other bear experts disagree that the grizzly population is out of danger. A retired bear biologist stated that three of the bears’ four main sources of food have declined recently: “We’ve got catastrophic loss of whitebark pine, catastrophic loss of cutthroat trout, and major declines in numbers of elk. [Only] army cutworm moths are hanging in there,” he told the Jackson (WY) News and Guide. No posts from me next week, since I’ll be attending the American Geophysical Union annual meeting to learn more about new research pertaining to Yellowstone. In order to protect the waters of Yellowstone, all motorized and non-motorized watercraft entering the park’s lakes must now pass an Aquatic Invasive Species (AIS) inspection on their boats as part of the watercraft permitting process. National Park Service staff will also conduct daily required inspections, seven days per week, for all boats that launch from Bridge Bay, Grant Village and Lewis Lake boat ramps. Information on boating and boat permitting in Yellowstone can be found at http://www.nps.gov/yell/planyourvisit/boating.htm. Information on AIS can be found at http://www.nps.gov/yell/planyourvisit/fishingexotics.htm. The park has updated its fishing regulations for the season which began on Saturday, May 25, with the goal of aiding the park’s Native Fish Conservation Plan. Native fish found in Yellowstone waters include cutthroat trout, mountain whitefish, and Arctic grayling; all of these must be released unharmed when caught. Anglers are reminded that they may use only barbless artificial flies and lures and lead-free sinkers when fishing in the park. To help protect native fish species, the limit on non-native fish caught in the park’s Native Trout Conservation Area has been eliminated. This includes all park waters except the Madison and Firehole rivers, the Gibbon River below Gibbon Falls, and Lewis and Shoshone lakes. Rainbow or brook trout caught in the Lamar River drainage must be harvested in order to protect native cutthroat trout in the headwater reaches of the drainage. This includes Slough and Soda Butte Creeks. 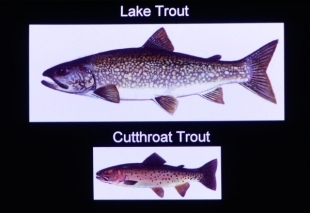 Anglers are also reminded that all lake trout caught in Yellowstone Lake must be killed to help cutthroat trout restoration efforts. Absaroka-Beartooth Front. Photo ©2011 Dave Showalter/ iLCP. When my husband Bruno and I accepted an invitation to a downtown San Francisco reception given by the Greater Yellowstone Coalition, we thought it would be fun to meet some people involved with this organization and learn more about what they do. Walking into The Matrix one evening last week—the only rainy week we’ve had this winter in the Bay Area—we were greeted by friendly people, not just by barkeeps but by GYC board member Charlotte Vaughan Winton and very tall, bearded Executive Director Mike Clark. The Matrix is a Marina District jazz club owned by Judge William Newsom, father of the former mayor of San Francisco and present Lieutenant Governor of California Gavin Newsom. We were in good hands, and Judge Newsom was most generous with free drinks and hors d’oeuvres. The serious part of this gathering was to explain to us what and where the Absaroka-Beartooth Front is and why it needs protection. 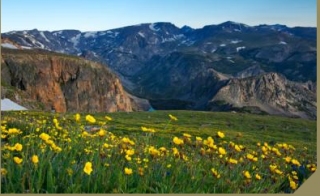 The slide show given by Northwest Wyoming Director Barbara Cozzens did not provide a map but did include interesting pictures of the rare high-elevation meadows, mountain views, bighorn sheep, and unspoiled terrain. The area is roughly defined as the area of public lands just east of Yellowstone Park in Wyoming, a good deal of which is on the Shoshone National Forest. Shoshone National Forest is in the process of updating its management plan this year. They need to find a balance between the pressures of interests advocating industrial and motorized use of the area and people and organizations who believe in trying to manage the land and wildlife with the long view toward conservation for future generations. The Front hosts the full complement of native Yellowstone wildlife, including large herds of all of North America’s big-game species—pronghorn, elk, mule deer, moose, bighorn sheep and mountain goat—as well some of the highest concentrations of grizzly bears and wolves outside of a national park. Genetically pure populations of Yellowstone cutthroat trout inhabit the region’s pristine, free-flowing rivers and streams. This area also supports a number of significant big game migration routes, including one of the longest-known elk migration routes in North America, with animals migrating over 60 miles from the southeast corner of Yellowstone National Park to the region’s public and private lands. A map and much more information is at: http://greateryellowstone.org/issues/lands/Feature.php?id=300.